Sleep apnea is a condition in which the patient begins to slow their breathing to the point that it is no longer measurable and then suddenly jerk back to an awakened state. The problem is this can happen hundreds of times during the course of trying to get a good night’s rest. It leads to a steady decline in overall health when left untreated and unrecognized. Obstructive Sleep Apnea is a little different from traditional sleep apnea. It involves upper respiratory obstruction that ends up closing off the airway or causing such deep snoring that it disturbs your sleep pattern. The good news is that obstructive sleep apnea is much easier to treat since it relies on physically manipulating what is obstructing the airway for improvement. Dr. Perkins is the sleep apnea specialist of Vancouver WA. Our expert dental team can explore possible causes of sleep apnea based on symptoms and medical history. We can create a customized oral appliance you wear as you sleep that keeps your airway open and unobstructed. 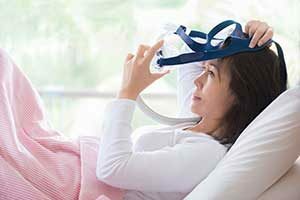 Oral devices are a popular alternative to CPAP machines as they are safe to use, easy to clean, and comfortable to wear. Call us at New Image Dentistry and make an appointment to begin the process of taking back your sleep from sleep apnea. In addition to comprehensive dental services, we are fully knowledgeable to provide sleep apnea treatment for you and the entire family throughout the Vancouver WA area.